← Wednesday Writing: Print it out! This week I head back into teacher training and setting up my classroom. Next week, the kids are back and the school year starts up again. I’m not sure how much I will manage to do differently, but one book this summer has certainly changed my thinking on many behaviors I see from kids in the classroom. 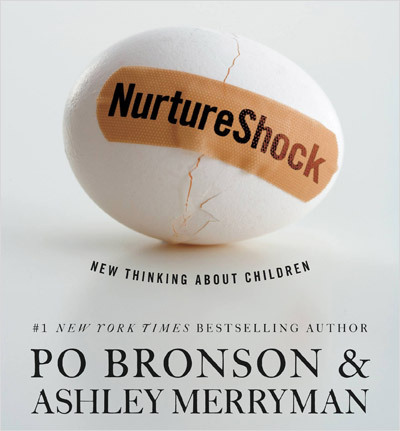 If you’re looking for a book to help you understand why kids act the way they do — either for teaching purposes or for parenting– I highly recommend Po Bronson & Ashley Merryman’s book Nurture Shock. Bronson & Merryman debunk many myths in the ways we think about kid’s thinking and, by analyzing trends in brain science research, show how other (non-intuitive, non-mainstream) approaches to kid’s learning and behavior are often more successful than what we usually do. Curious about why an hour less of sleep, on average in a generation, has spawned a host of problems plaguing our educational system? Would you like to know how to successfully argue with (or in front of) kids? Want to know why praising a kid for being good at something actually leads to low self-esteem and an increased likelihood of cheating? It’s all inside… and totally worth a read. This entry was posted in Language Learning, Media, Teaching. Bookmark the permalink.